Not only our hostel is located in heart of city in Osaka, but we can see temples and shrines, a traditional Japanese shopping arcade around. 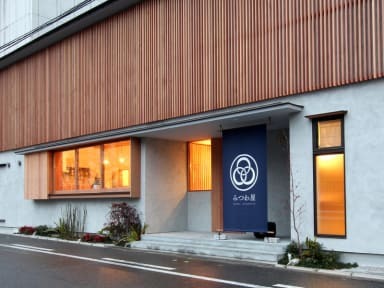 Enjoy such a special location and traditional warm atmosphere in Hostel Mitsuwaya Osaka. Our reception is open for 24H, our friendly staffs always welcome you with a big smile. Please feel free to ask any questions. We are always happy to help you and make your comfort and enjoyment during your stay! In Hostel Mitsuwaya Osaka, we have super cozy 5 type rooms. 8-Bed Female Dorm, 4-Bed Female Dorm, 12-Bed Mixed Dorm, 8-Bed Mixed Dorm, 6-Bed Mixed Dorm. Shared spaces are available for 24 hours (Kitchen, Shower room and Common area). There is a restroom and a shower room for female only. 24H Reception, Wi-Fi, PC, Hairdryer, Fridge, bread(8am-10am), jam(8am-10am), Coffee, Tea, Maps, Shampoo, Conditioner, Body Soap and Luggage Storage. 1. Check-in Time: 3:00pm - 10:00pm. (1) If you will be arriving later than 10pm, please contact the hostel in advance. (2) Guests will be required to show an official ID with photo at arrival. - Please inform the hostel one day before your check-out date in case of that you leave before 8am. 3. Payment: Cash (Japanese Yen) only when check-in. (5) No-Show/On the day of arrival: 100% of accommodation fee. 5. Age Restriction: Guests must be at least 18 years to stay at the hostel. (1) Once you have checked in, there is no curfew. (2) After 10pm, the entrance door is locked for security reason. (3) You may exit and enter the hostel with password at any time. One of the best things about this hostel is the staff. They are very kind and welcoming and made you feel at home. The environment feels very cosy. The beds had quite a bit of space to move around. The washing facilities were very useful, just need to pay. Everything was kept clean and tidy. The location is good; it's close to the Dotonbori (20min walk). Also close to the subway which is very convenient. Overall, I had an enjoyable stay. Thank you Mitsuwaya! GREAT place to stay and use as home base. Super clean, helpful staff, mellow neighborhood but close to everything. 3 different subway stations close by as well as a train station. Rented a bike from them for 500 Yen ($4.50) and biked ALL DAY LONG. They had good maps and a suggested route. Clean, quiet. Free coffee. Women's dorm was great and on first floor so no carrying bag up stairs. Hot showers, high tec toilets. Can't say enough about this hostel. FAbulous value! Loved the helpful staff!! Was a bit noisy but otherwise a very pleasant stay. The staff was extremely friendly and helpful. Great place - just like all the other comments. Amazing location not too far from everything, and I'd recommend renting the bike to get around. Absolutely amazing people working here, they even set up a picnic under the cherry blossoms in the park that was perfect and unforgettable! Thanks for everything you guys!! This is a great little hostel in a quiet neighbourhood. The staff here are friendly, fantastic and really made my stay! The hostel was very clean and the staff spoke English and were very hospitable. The bed was also spacious and you get your own locker but be sure to carry your own lock. They had free coffee and tea in the kitchen and they also had complimentary breakfast (bread and jam). Personally I like to have my bed made but they gave us mattress and blanket covers and we had to put it on ourselves. The staff are really friendly and helpful and the room and toilets are clean. The hostel is quite far away from the city centre. If you want some quiet time in the city, this hostel will certainly be perfect for you.